I know most of you are on the edge of your seats waiting to hear about Connor's delivery (NOT), but you will have to wait a little bit longer...I am trying to keep your attention with the suspense! 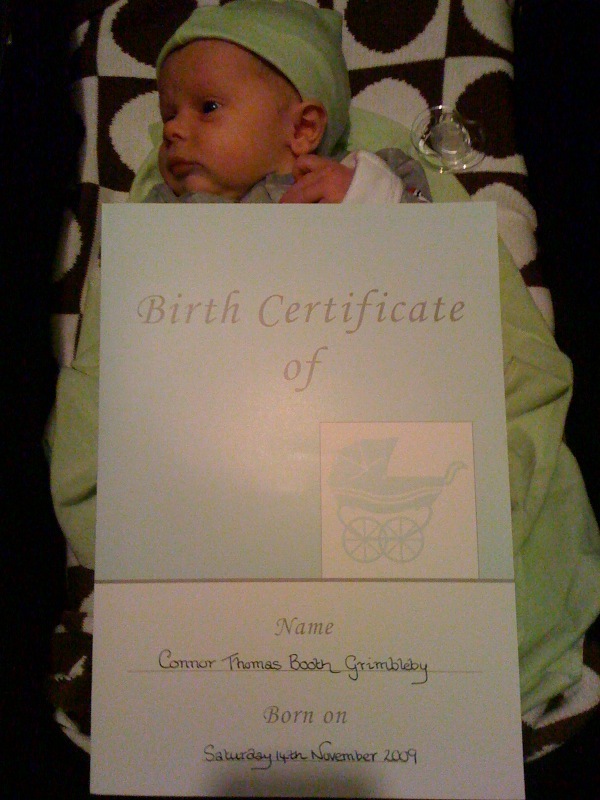 Today we went and registered Connor's birth and picked up his birth certificate. The certificate in the picture is just a folder that the real birth certificate came in, but it is still very cute and the lady that filled it out obviously had wonderful penmanship...something I always got a bad grade in! While registering Connor's birth, they ask all sorts of questions. When they asked "occupation", I asked if I could say anything I wanted. The lady said she guessed so. So, I responded with, "What if I say I am a rodeo clown?" She did not seem to see the humor in that and kind of just moved on...don't worry though, on the birth certificate, it does not actually say rodeo clown as my occupation. It says something much more exciting...barista! Yesterday I realized that Connor currently has no citizenship. He is a man without a country. This struck me as odd. He doesn't just qualify for British citizenship by being born here. It's a long story, but we are working to get it for him. And, we have yet to apply for his American citizenship. So technically, my child is without a country...kind of weird. Good thing he has a birth certificate! I'm glad to hear that Connor is official! YEAH!!! !